Someone close to me once (well, many times) made the joke, “pets and their owners” (meaning, I was crazy, so my pets are too. This is not really far from the truth). 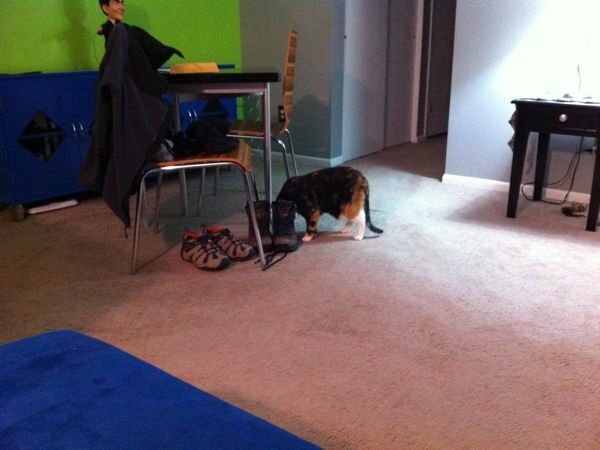 My cat thinks she is a dog. She snuggles, she HAS to sleep in my armpit (don’t ask) and she is constantly seeking attention. Someone apparently forgot to tell her she is a cat. I also got her when she was five years old, so she figured out pretty quickly I was a soft touch. Little furry terrorist. The dog, however, thinks she’s a cat (well, I guess, all things being equal, this works itself out). She doesn’t climb on the furniture – I don’t think it has occurred to her that a) she could and b) I wouldn’t complain. She comes over for “pets” on her terms, which usually means five minutes, you can scratch my ears, and I’m over you. I’ll be on the floor if you need me. I live with these little furry conundrums and I wouldn’t trade it for the world – there’s never a dull moment in my household. Just look at them. This is the only time they work together. If they actually start holding meetings I am doomed. Yeah, someone was not getting her way. 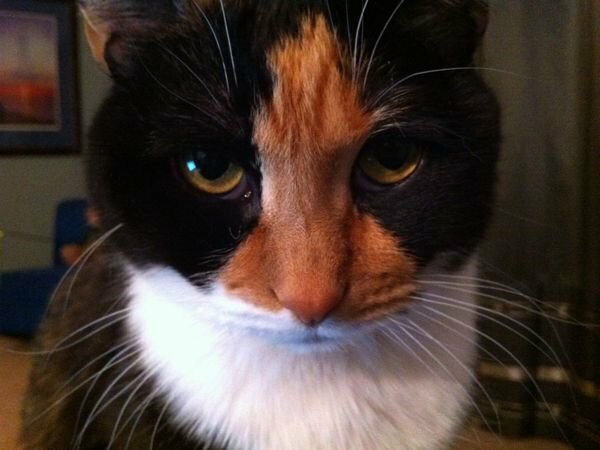 Calico ‘tude, she has it. (That’s water, I swear. 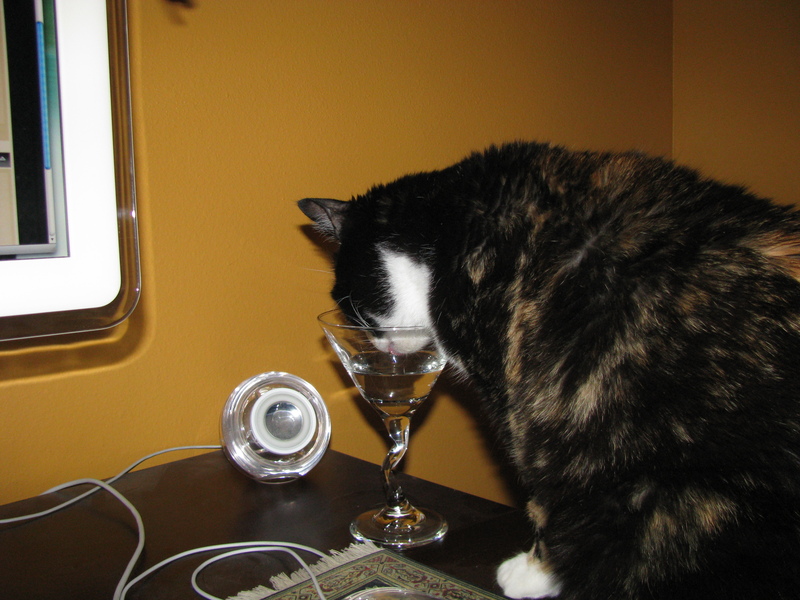 She won’t touch a martini. Well, she IS only nine. Not old enough to drink yet.) 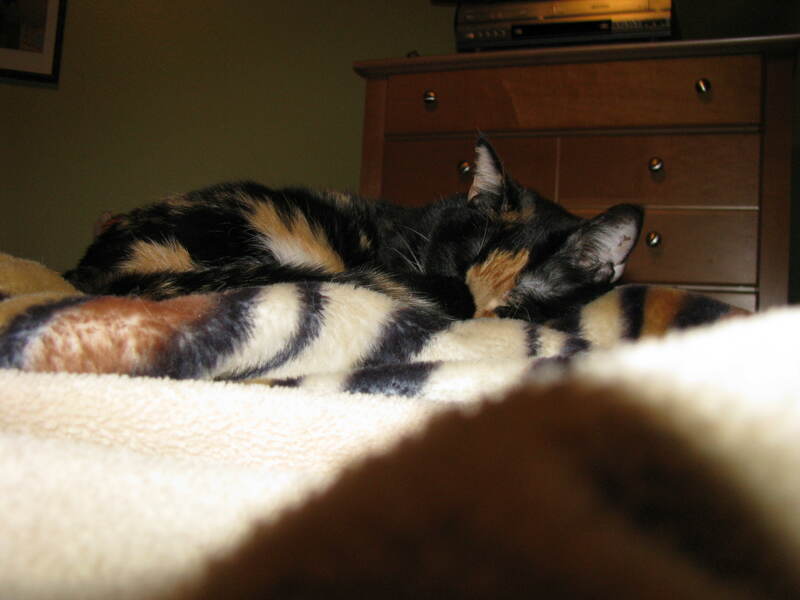 Here you can see the “tortie in the back” coloring. It looks like someone stuck peroxide-covered fingers in her fur. Thus her name: it looks like some of her pixels have burned out. I am madly in love with this little furbeast, in spite of the fact that she has puked in my bed and wakes me up at 5am with a paw to the face. It’s been said that dogs have people, but cats have staff, and I find that to be completely true. Still, whenever she crawls into my lap and purrs, my heart melts. Yeah, we all know who’s running the show here. My Cat is Insane. And I Have Proof. For starters, just look at that face. Look, I love my cat. Frankly, the fact that she is cute is probably the only reason she is still alive right now. Let me explain. Pixel is insane. 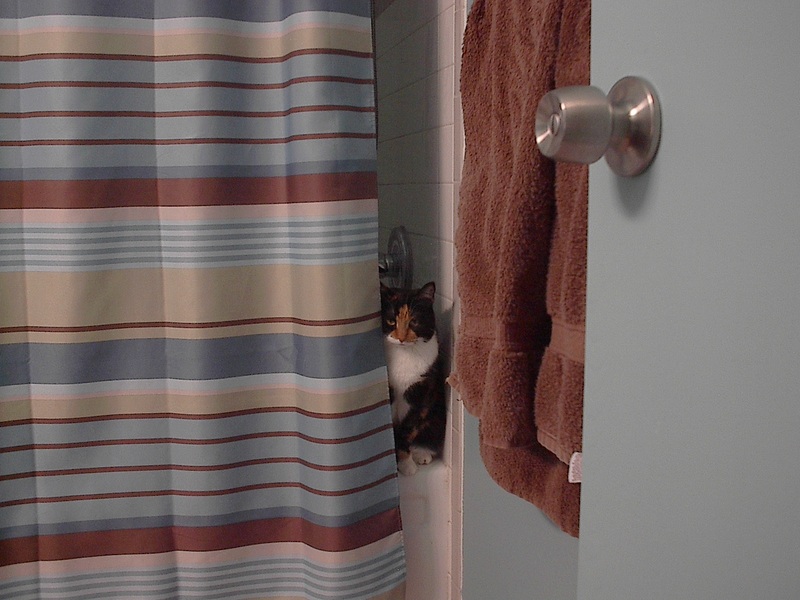 Let’s start with the fact that she’s a calico (recessive red gene, born to be crazy) and also the fact that she was apparently taken away from her mother when she was two weeks old (says the former owner, who was a bit batshit herself…). Then we’ll go on to the fact that she has a serious obsession with plastic bags. ANY plastic bags. You cannot set a plastic bag down in this house for more than ten seconds before she is all over it, chewing it to death. It is insane. I have actually had to put childproof locks on the cabinets so she cannot get to the trash bags. Yes, I recognize the irony of a childfree woman having to childproof her house…because of a cat. Well, we thwarted that bad behavior (because, let’s face it, it’s not good for her and she usually ended up barfing on my bed at 3am – which was still cheaper than the vet bill had she managed to rearrange her intestines due to her obsession, which quite frankly had me extremely worried). So, since she can’t get at the plastic, her new target is…the toilet paper roll. Now, I’m less worried about this, as paper is fairly harmless, but WTF? I do not want to have to roll to the “unchewed” part of the roll when I want to use the paper. It’s an on-again, off-again thing, and when I catch her doing it while I’m putting on my makeup in the morning, I have to hide the roll in the cabinet before I go to work so that I don’t have chewed bits all over the house when I come home. WTF is wrong with this cat? Wow. Also, WHY is there always a toy in the water dish? If it’s a “special” day, there’s one in the food dish as well. Currently the water dish toy is the YELLOW toy, so apparently yellow is her favorite color. Weird. God help me, I live with a four-legged crazy person. I have a cat. I have boots. This has lead to an interesting observation. Cats REALLY like boots. WHY? My cat, Pixel, loves shoes. Boots in particular. When Keith comes over she likes to check out his shoes, and once, when he had his snowshoeing boots out, she went positively insane checking them out. Yes, that is her head in my boot. I would also like to point out that the shoes featured in the picture were completely ignored. Obviously, because there were OMG BOOTS!!!! Seriously, WTF? That damn cat was in my boots for the better part of an hour. Are they really more interesting than shoes? I leave shoes out all the time – I never see this. What, exactly, is this cat/boot phenomenon? I only have one cat, but I can clearly be designated as a Crazy Cat Lady, because I have totally fallen under the Furry Little Kitty Spell they conjure so well. I was a bird person for years. I had a Cockatiel, Meep, for thirteen years, and somewhere in the middle of that I had Neelix, a Quaker Parrot I rescued from a woman who honestly thought a parrot and a day care would go well together (you bird people are spitting mad right now, aren’t you? Now you know why I took her). Don’t get me wrong. I loved my birds. But birds are unlike any other pets – you can’t leave a bird with just anyone – really, birds are as smart as 3-5 year olds, depending on the breed. They are a LOT of work. They are also a lot of fun, but realistically they can outlive you in most cases, so you really need to find them a good home if you die. And you need to plan this in advance. When Meep died a couple years ago (I was devastated; she waited until I’d left the house to pass on, as many birds do, and I was heartbroken and guilt-ridden that I wasn’t there for her) I realized that I was in my early forties and any bird I got had the potential of outliving me. This would have been okay if I had anyone I could “will” her to, but, like I said earlier, birds are a lot of work to keep, if you keep them well. I knew I could not live my life without a pet. Some people were put on this earth to care for children; I honestly feel my purpose is to care for the fur-and-feather creatures. So, after considering my options, (and knowing I could NOT live a life without a pet) I decided I would get a cat. I’ve never had a cat; I did HOURS of research on the ‘net about care, and feeding, and behavior issues, and decided that yes, I could take a cat into my home. I also decided, since Meep died in early November, that I would wait until the first of the year to get a new pet. I made it six weeks. 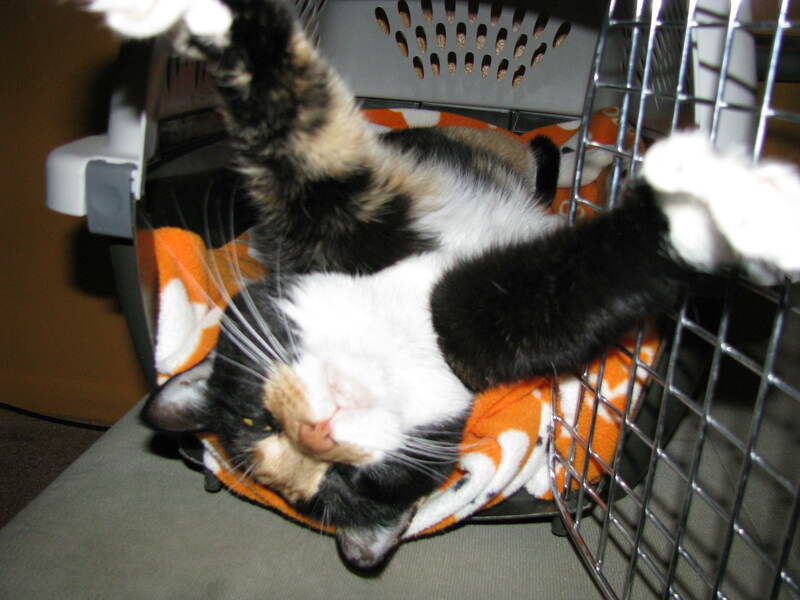 I was “looking” on the Ft. Collins Cat Rescue website, just LOOKING, mind you, and I saw her. She was in Larimie, Wyoming, and I was four hours away. There was something in her face, though. I stared at her picture for HOURS. I told myself it was too soon. Ultimately, I emailed her “parents”, we agreed to meet halfway in Cheyenne, and I got myself a cat. Oh my God. I am SO in love with her. The thing about cats versus birds, is that cats can come sneaking in your room when you go to bed, purr in your face, and curl up and sleep with you. It took her a couple weeks, but Pixel (formerly Ewok) decided I was her human and now I have a little furry sidekick that hangs with me wherever I go in the house. I just returned from a four day trip wine tasting in Palisade, and I got bitched out for about thirty minutes from my “calico in the front, tortie in the back” (as the vet calls her) furkid for leaving her with a petsitter. Awww, she missed me. I know I will have a little furry shadow for the next several days as she makes sure I have no intention of leaving her again. I can’t describe the love of an animal for a human. Or a human for an animal, for that matter. But I can tell you that this little cat has become my constant companion; my little furry validation that I am important and meaningful in this world. I will weep bitterly for her when she goes to the clearing at the end of the path.